Crofton's Dam Race (2019) - AllSportCentral.com - Registration. Results. Relax. RACE DETAILS: A new kind of triathlon in Northeast Nebraska along the picturesque Lewis & Clark Lake in Crofton, Nebraska! Competitors 14 years of age and older will kayak 1.5 mile on the lake, run a 5K through the Weigand campground and bike 12 miles into downtown Crofton for a BBQ and celebration. Teams or individual participants are welcome. EVENTS: Individual racer completing all three legs of the race or 3 team members each completing one portion of the race. ENTRIES: Please complete the online entry form at All Sports Central. Each entry will receive a t-shirt, bib, and meal at the conclusion of the race. 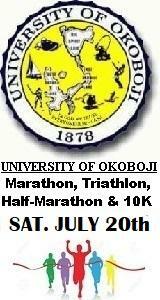 After July 20th, entries will be allowed with a $10 late fee. Walkups the day of the event will not be guaranteed a t-shirt and have a $15 late fee. SCHEDULE: Early check-in Friday, July 26 from 6-8 p.m. at the Crofton Pulley Museum. Check-in at the Weigand Swim Beach between 7-7:40 a.m. All competitors must check-in at this time. Individual race begins at 8 a.m. with kayaking first. The team race will begin once all individuals have finished the kayak leg of the individual race. PRIZES: The overall individual winner will receive a trophy. The individual winners of each age group and the fastest team will receive a medal, a gift bag with various Crofton business sponsor items, along with $50 in Crofton Community Bucks. Crofton Community Bucks can be used anywhere throughout Crofton. LODGING: Stay in Crofton at the Lewis and Clark Lodge or the Historic Argo Hotel. Camping is also available at the Weigand Campgrounds. Make arrangements early as limited rooms are available. OTHER: Extra t-shirts and meals can be ordered for spectators and supporters. T-shirts will be a dry-fit style shirt. T-shirts are $15 each and meals are $10 for adults and $8 for kids. For information, contact Johnnie Ostermeyer (402-508-0224, jostermeyer15@gmail.com) or Heidi Marsh (605-660-4498, heidi.marsh.ne@gmail.com). Please Note: There are no refunds or transfers for this event for any reason including weather related issues and cancellation. This event will start on the swim beach at Weigand Marina. Competitors will kayak 1½ mile to the Burbach Campground around a buoy then back. Next, the 5K run on a marked trail throughout the Weigand campsites. Finally, ending with a 12-mile bike ride back to Crofton finishing at the Pulley Museum on Main Street. TEAM CAPTAINS: Must register entire team during registration by first registering as a captain, paying for the entire team, then clicking on the proper link on the receipt page to enter remaining team members. If you need to add or edit team member information after you have registered as the team captain, simply login with the AllSportCentral Athlete account that you used when registering and select MANAGE TEAM ROSTER icon from your Athlete home page. This will allow you to update your team roster. Marathon course from Weigand Recreation Area to Crofton.